Schnell '87 was inducted into the Northwest Athletic Conference Hall of Fame in June. 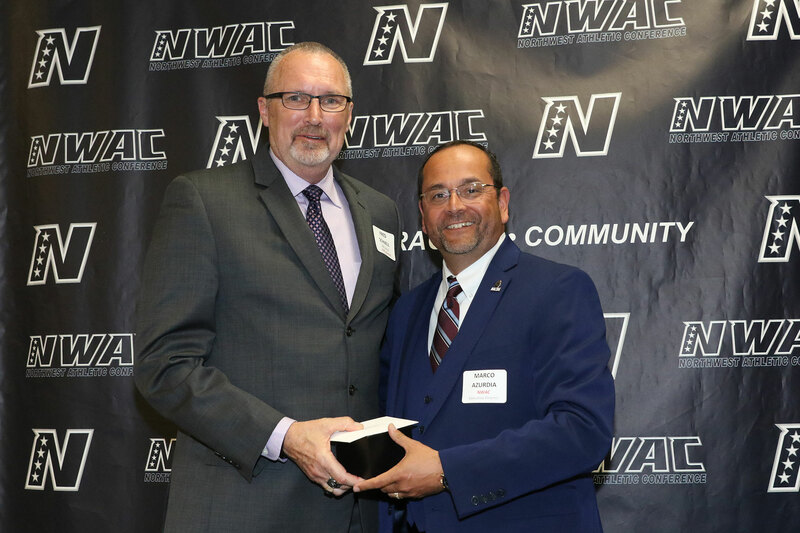 Fred Schnell, a 1987 graduate of the Wayne State College Master of Science in Education program, was inducted into the Northwest Athletic Conference (NWAC) Hall of Fame in June 2017 for his 27 years of service to Mt. Hood Community College (MHCC) in Gresham, Ore., where he serves as a health and physical education instructor, and to the NWAC. While at WSC, Schnell served as an adjunct instructor in health and physical education, and was hired as a full-time faculty member in the fall of 1990. He was also the assistant men’s basketball coach from 1985 to 1990. His wife, Melodee Schnell, was a former residence hall director of Bowen Hall at WSC. Schnell served as the MHCC men’s basketball coach for eight seasons, leading his team to a second-place finish in the NWAC Championship in 1994, and three third-place finishes in the NWAC Southern Region. After coaching, he worked at MHCC as the associate and head athletic director. He also served as the Mt. Hood men’s commissioner, was a member and chair of the NWAC Men’s Basketball Committee, and an NWAC Executive Board member. Today, Schnell focuses on his role as a health and physical education instructor at MHCC, teaching classes on weightlifting, life fitness, and basketball skills.